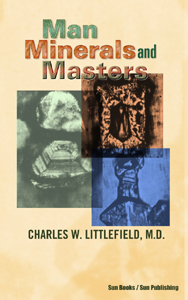 MAN, MINERALS, AND MASTERS by Charles W. Littlefield, M.D. School of the Magi, Three Masters, The Cubes, Initiation in Tibet, Hindustan, and Egypt, History, Prophecy, Numerology, Perfection. 172p. 5x8 Paperback. 172 pgs. 5x8. Paperback. ISBN: 0-89540-059-6. $16.00.